The Dii Consentes, also as Di or Dei Consentes (once Dii Complices), was a list of twelve major deities, six gods and six goddesses, in the pantheon of Ancient Rome. Their gilt statues stood in the Forum, later apparently in the Porticus Deorum Consentium. Livy arranges them in six male-female pairs: Jupiter-Juno, Neptune-Minerva, Mars-Venus, Apollo-Diana, Vulcan-Vesta and Mercury-Ceres. Three of the Dii Consentes formed the Capitoline Triad: Jupiter, Juno, and Minerva. The grouping of twelve deities has origins older than the Greek or Roman sources. The Greek grouping may have Anatolian, more precisely Lycian origins. A group of twelve Hittite gods is known both from cuneiform texts and from artistic representation. The Hittite Twelve are all male, with no individualizing features. They have a possible reflex in a Lycian group of twelve gods in the Roman Empire period. By 400 BC, a precinct dedicated to twelve gods existed at the marketplace in Xanthos in Lycia. Herodotus also refers to a group of twelve gods in Egypt, but this finds no confirmation in Egyptian sources. The Greek cult of the Twelve Olympians can be traced to 6th century BC Athens and probably has no precedent in the Mycenaean period. The altar to the Twelve Olympians at Athens is usually dated to the archonship of the younger Pesistratos, in 522/521 BC. By the 5th century BC there are well-attested cults of the Twelve Olympians in Olympia and at the Hieron on the Bosphorus. The references to twelve Etruscan deities are due to later Roman authors, writing long after the influence of the Greek pantheon had become dominant, and must be regarded with skepticism. 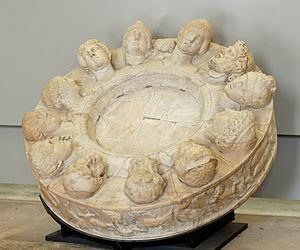 Arnobius states that the Etruscans had a set of six male and six female deities which they called consentes and complices because they rose and set together, implying an astronomical significance, and that these twelve acted as councillors of Jupiter. Scholarly evaluation of this account is dependent on the hypothesis that the Etruscans originally immigrated to Italy from Anatolia. In this case, the Etruscan Twelve might have been cognate to the Hittite Twelve. It is, however, just as possible that the Etruscan Twelve were simply an adaptation of the Greek Twelve just like the Roman Twelve. ^ Samuel Ball Platner, The Topography and Monuments of Ancient Rome (1904), pp. 173–174. ^ Ennius, fragment 45 = Apuleius, De deo Socratis, 2.28–29. ^ a b Long (1987), pp. 144-186. ^ a b Long (1987), p. 232. Long, Charlotte R. (1987). The Twelve Gods of Greece and Rome. Vol. 107 of Études préliminaires aux religions orientales dans l'Empire romain. Brill Archive.